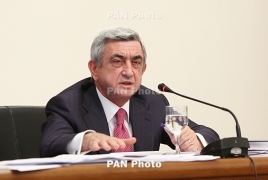 PanARMENIAN.Net - Third Armenian President Serzh Sargsyan has spent 5 hours at the Special Investigative Committee for questioning as part of a probe into clashes between the police and peaceful protesters following the presidential election in 2008, Armtimes.com reports. According to the media publication, Sargsyan was questioned on February 1, and his question will continue later. The Investigative committee has yet to comment on the allegations. Former Defense Minister Seyran Ohanyan and second President Robert Kocharyan are among the handful of officials charged as part of the investigation. 10 people were killed in the clashes on March 1, 2008.